Download top and best high-quality free True Story PNG Transparent Images backgrounds available in various sizes. To view the full PNG size resolution click on any of the below image thumbnail. 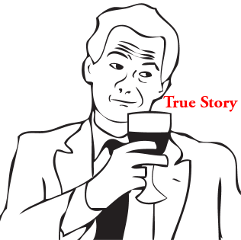 True Story is a meme and rage comic character based on a black and white outline drawing of How I Met Your Mother character Barney Stinson (played by actor Neil Patrick Harris) smiling smugly, while holding a glass of wine. Often accompanied by the words “true story”, a character can mainly be found in the final panel of rage comics or indicate or falsely claim that it is based on a true story.